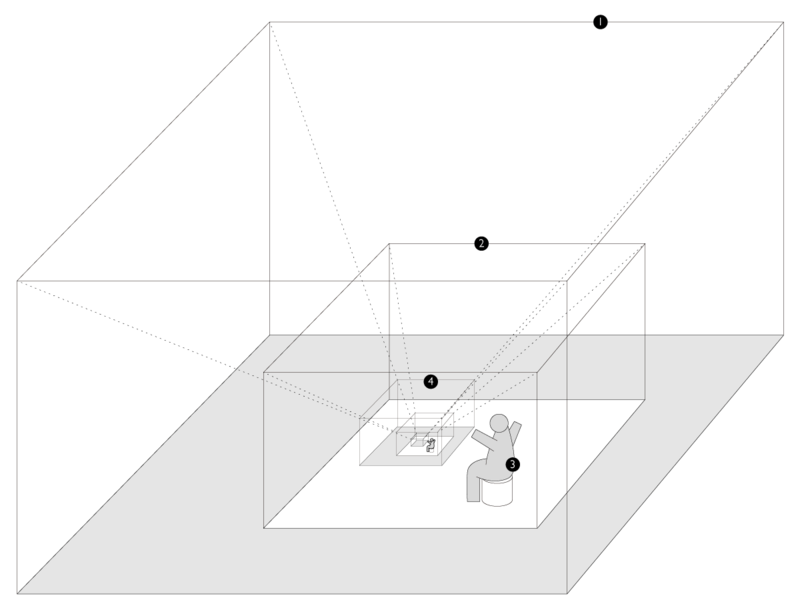 If we put site model back to the place it represents, observer will be “inside” the site and “outside” the model (a scaled site) simultaneously. 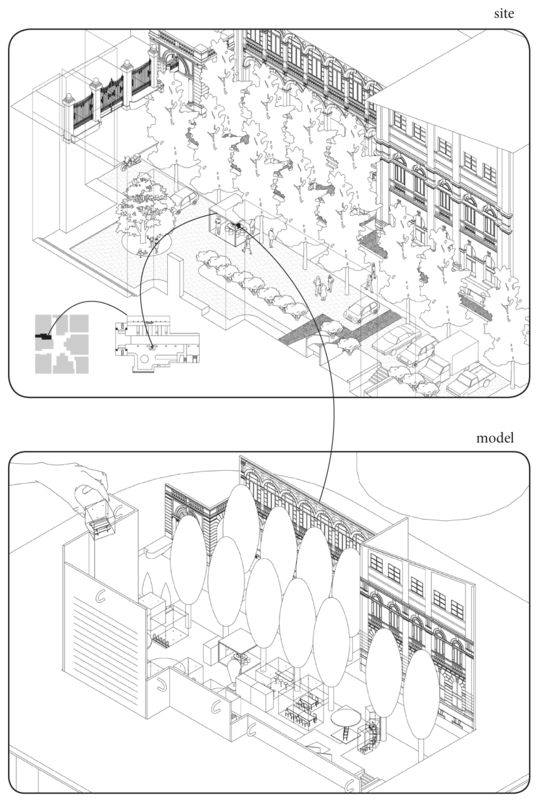 We termed the approach in-site modelling and the model in-site model. By doing so, all information the real site has and a simplified version of that could be connected, compared, thought, part by part, over and over. Apart from helping on site reading, in-site model should be playable as well (why not). In reality, most of us might become the user of a place ahead of becoming its observer. We use places intuitively. We pass by the same street everyday with countless things in our head except the street. We jog in a park nearby while hearing our favourite music. The park is invisible. We walk our dog in another park and chat with other dog owners. That park is also invisible. However, if someone throw a playful in-site model in front of us and invite us to play, and if we do play, we can then see things we normally don’t see and start to imagine things out of routine. What else can I do here? With whom? What would a cat do here? 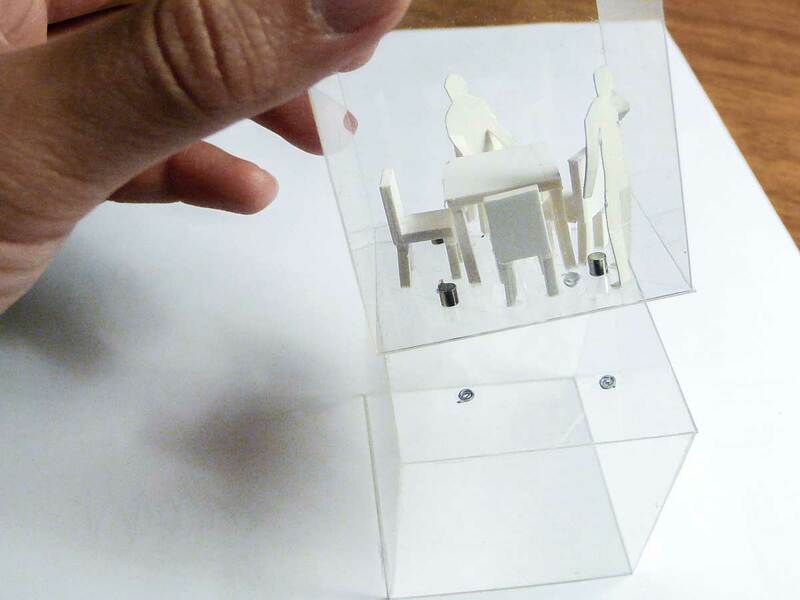 We can put all the ideas on in-site model and show to the other people. Idea exchange is about to happen. Getting awareness of a place is somehow like rooming a space. Space is invisible and sounds abstract, while room is tangible and experienceable. 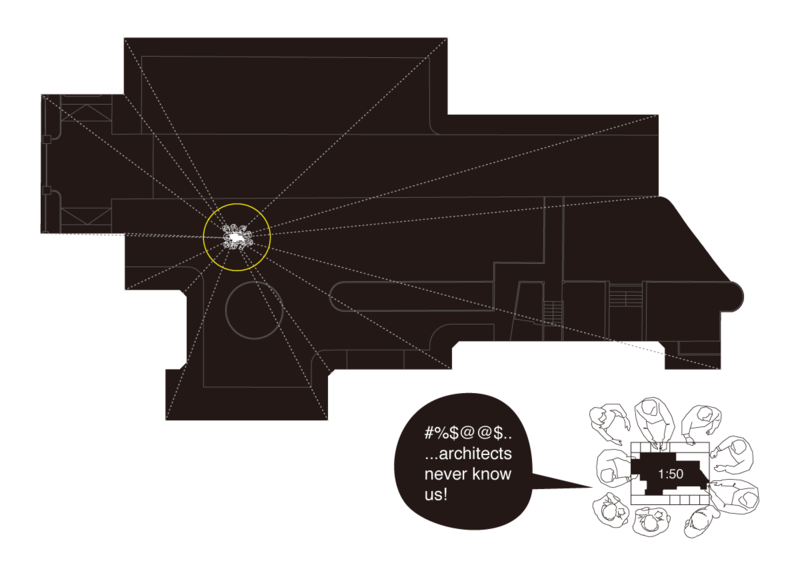 In-site model should be able to translate space into rooms, for us. In believing properly handled cooperation yields better outcome, we expect “in-site modelling” to bridge the knowledge gap between designer and non-designer, making conversation easier and more productive. An environment which can be perceived as one environment but not several environments apart. It should have perceivable borders: architecture facade, an array of trees, a river, thresholds and so on. A bedroom size shelter, serving as an intermediate scale. 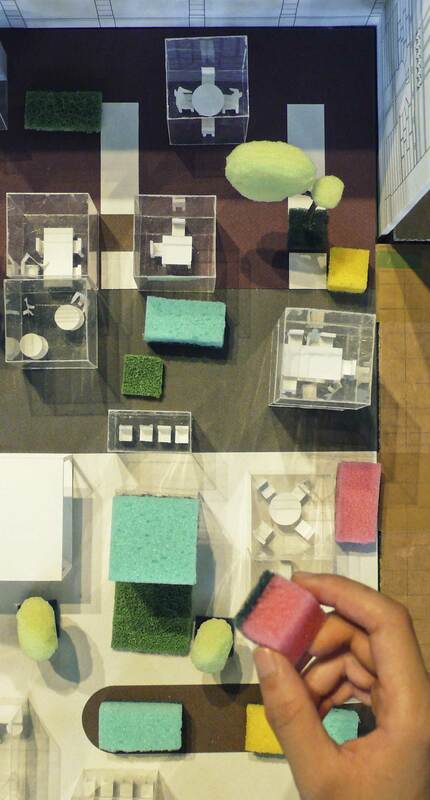 A model represents the environment in 1:50 (or any other convenient scale). It should not only show the things originally exist in the environment, but also the shelter and the model itself. A scaled person stands beside. All these should be on a table roughly 60 cm high, encircled by 5 to 8 chairs. Note: In between human scale and environment scale, the shelter provides a familiar dimension (bedroom-size). Having the opportunity to connect “self” with the shelter and the shelter with the environment, people can feel their presence better in the environment. The height of the table ensures handicapped people and children can participate effortlessly. 1:50 is a good scale to show furnitures. We all had experiences of moving furnitures here and there to arrange or rearrange our home. To imagine what we can do in any given environment, we need the help of furnitures. Furniture sets enable players to think “what can happen” rather than “how to realize so”. One set, one life scenario. If one think four people can play cards here, then he or she can simply drop a four-person table set, leaving ergonomic stuffs to us. 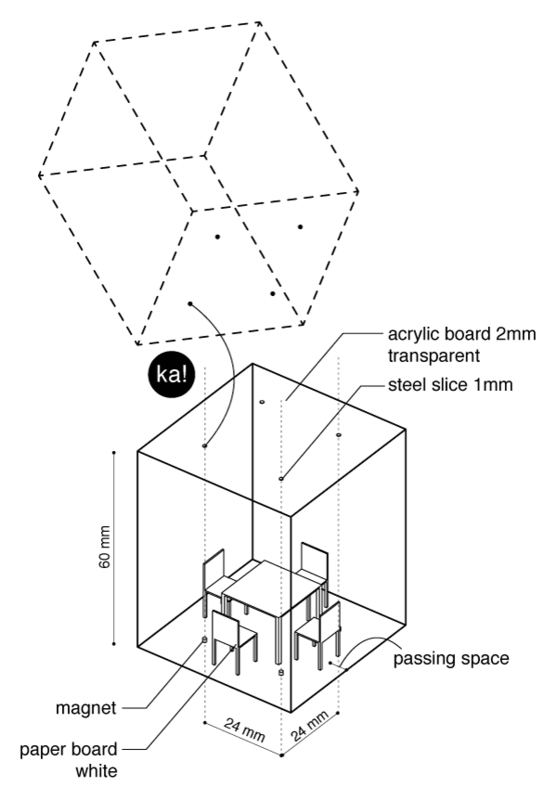 Furniture sets or scenarios are kept in transparent boxes for the sake of easy handling. What’s more, magnets are introduced to bind things together, quickly and flawlessly. So if you imagine a tower dedicated to playing cards, you can easily pile up several table-sets and they are going to be firm. Additionally, we found people just love magnet. We saw classmates and professors started to smile from the moment of hearing the sound “Ka!” while playing the model we made for school assignment. 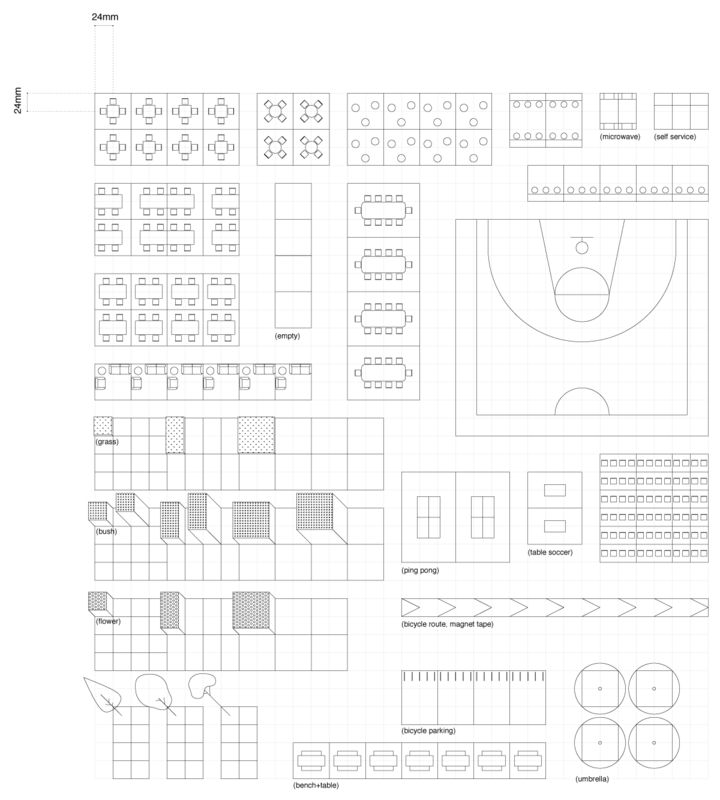 If we have many boxes and they are going to form a satisfactory number of variations, a module is needed. Well, it is more or less like LEGO. Politecnical di Milano participated in an international project called “sustainable campus” when we were studying there. The project involved some architecture design studios in including the one we participated. So we were asked to create a sustainable campus. In other words, a better used campus. The general approach of using so was predefined, called bottom-up. It means campus users should initiate something and then university can support by whatsoever means. For instance, “bottom” can provide useful information for “up” to improve their services. The problem was (probably still be) campus users didn’t show too much interest in their campus. Therefore, in our opinion, if we don’t do something to nurture the initiative, nothing would happen for sure. Finally, we worked a simple and hopefully persuasive logic: it is my campus; I came here everyday; if I can use it better (physically); I can enjoy my life more. To use it better, one should understand it more. In-site model can make this happen pleasantly. 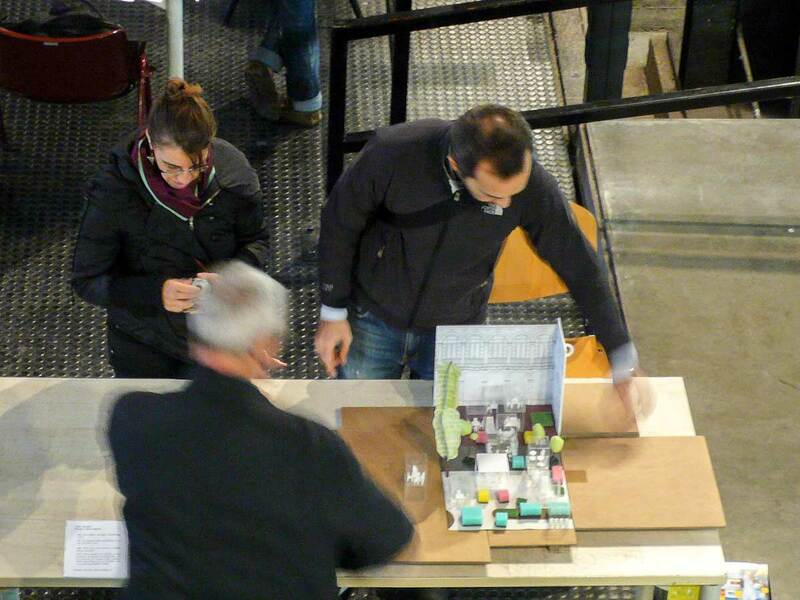 Based on a reasonable understanding of a place, polimi campus in this case, people might be able and more importantly be willing to participate in design process or even initiate something by themselves. 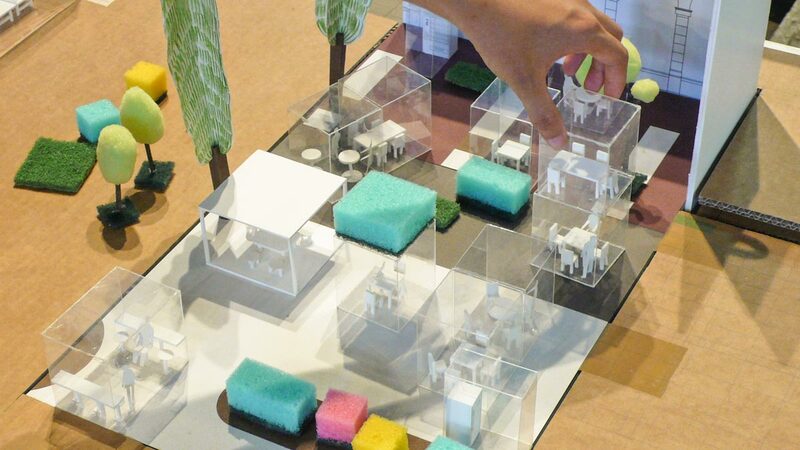 In fact, in-site model can be helpful for anyone to understand their surroundings. Kids, for example. It could be an educational tool for encouraging children to explore the neighbourhood or the city they live in. Or, it could be placed in a domestic environment, for which family members can sweat less to target a satisfactory arrangement. Or, it could provide an unique experience in exhibitions. A man-environment interaction game and many other potentials.